Holidays often entail plenty of partying with tons of food and alcohol. The aftermath- bloating! I'm here to help with some tips to battle bloating. Sodium - Increases water retention in the body. Steer clear of processed foods to really cut down on sodium intake. Artifical Sweetners - The chemical compounds in artifical sweetners are not easily digested and create excess gas in the body. Some studies show they increase appetite as well! Stevia, Splenda, Truvia, sorbitol, etc. are common artifical sweetners. Watch out for them in diet foods and drinks as well as sugar-free gums. Carbonated Drinks- The bubbles in carbonated beverages are carbon dioxide, when they pop they expand in your stomach and increase bloating. Water - Drinking about 8 glasses a day regulates digestion. Dandelion Tea - Dandelion is a natural diuretic, and will rid the body of excess water often caused by high sodium and/or carb intake. Fiber - Fiber helps move food through the digestive tract, expelling gases and toxins quicker, helping to rid you of bloat. Foods rich in fiber include oatmeal, raspberries, apples, corn, beans, nuts, broccoli and more! Probiotics - These are natural bacteria that regulate digestion. You can add more to your diet through supplements, or by eating probiotic-containing foods such as yogurt, miso and soy-based foods. Excercise - Moving around increases circulation, aids digestion and purges toxins and excess water through sweat! Just a simple 20 minute walk will help your digestion. A personal favorite beverage of mine to cut back bloating is lemon cucumber water! Combine all the above ingredients, let sit in the fridge overnight and your good to go! 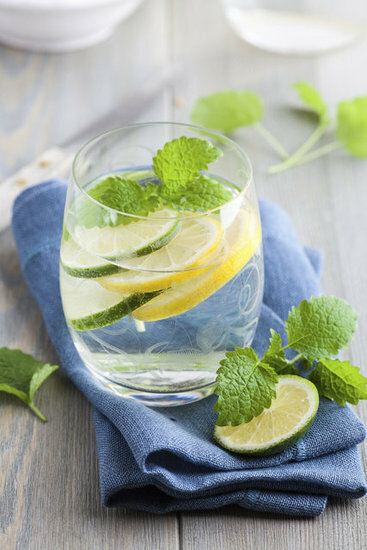 Lemon is a natural diuretic, cucmber has several anti-inflammatory properties, mint is sweet and stomach-settling and ginger has been used as a natural dietary cleanse for years. This water combined with a bloating-conscious diet always helps me flatten my stomach after parties and overeating. Hopefully these tips help reduce bloating and make you feel better after all the holiday partying. Best wishes!